Marsh, James H.. "Toronto Feature: Old City Hall". 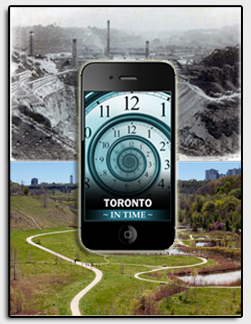 The Canadian Encyclopedia, 02 July 2015, Historica Canada. https://www.thecanadianencyclopedia.ca/en/article/toronto-feature-old-city-hall. Accessed 18 April 2019. 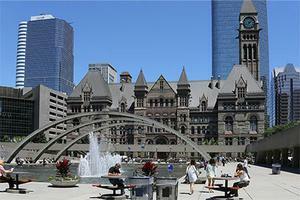 The east side of the Old City Hall from across Nathan Phillips Square, 2012 (photo James Marsh). Old City Hall looking north on Bay Street, 1907 (courtesy City of Toronto Archives, fonds1244-fl1244-it7142). 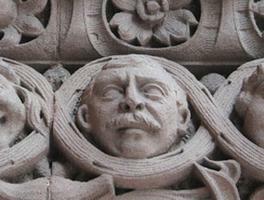 At the main entrance of the building, on the west side of the centre arch, Lennox's face is carved alongside other caricatures. He is identified by his handle-bar moustache, 2012 (photo Davina Choy). "Architect Gets Artistic Revenge on Enemies"
On its completion in 1899, Toronto's third city hall, now known as "Old City Hall," was the largest building in the city, and at that time the largest municipal building in North America. Its architect, E.J. Lennox, often called "the Builder of Toronto," was obsessed with showing that his building, complete with a clock tower soaring over Bay Street, could compete with the best that American architecture had to offer. Lennox was deeply impressed with the architecture of Henry Hobson Richardson. The Boston-based architect gave his name to a style known as Richardson Romanesque, which featured hipped roofs, squat and rounded door arches, heavy and thick masonry walls, turrets and towers. It was the kind of architecture associated with success and prestige in the last decades of the 19th century. City Hall was completed with great artisanship but also with large cost overruns, dissension and scandal. A dispute with the contractor ended with Lennox and the police storming the barricaded site. Lennox had the last laugh on some of the councillors he fought with by caricaturing them in the stone gargoyles over the arches. His own dispute over his bill for services went all the way to the Supreme Court of Canada (he lost). The key feature of the facade on Queen Street is a massive tower, placed off-centre so that it would line up with the middle of Bay Street. Officially opened in 1899, it took another year for the bells to be installed, just in time to ring in the new century. 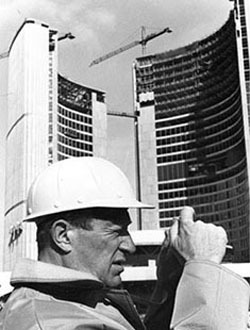 After the opening of Toronto's present City Hall in 1965 (see Toronto City Hall), Old City Hall was threatened with demolition. It was saved by concerned citizens and is today a National Historic Site.